In the 1986 World Cup, Diego Maradona reached his apotheosis, redefining what is possible on the football pitch amidst unprecedented fervor. In the 1986 World Cup, Diego Maradona, the world's greatest football player, reached his apotheosis, redefining what is possible for one man to accomplish on a football pitch. His ability to take control of the ball -- the game -- an entire tournament -- split the world in two. It was both illuminating and an affront, beguiling and an outrage, and the fervor that surrounded him was unprecedented, bordering on the religious. Constructed from archive material, "Maradona '86" is an ode to this ultimate footballing idol, basking in the operatic intensity of his performance in Mexico as he wrote his name on football history forever. 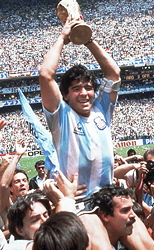 I didn't come to this film as a fan of Maradona, I have always had mixed feelings about him. One one hand I could see his talent is extraordinary -- he is a footballing phenomenon -- but the flaws and histrionics of his character affronted my somewhat straight-laced, northern European sensibility and, I'm afraid to say, tainted my appreciation of him. Making this film was a way for me to explore this contradiction and try to see Maradona from a viewpoint other than my own. Like any fascinating character, it is, of course, his flaws that make him so compelling and our love of football is as much about character and story as it is about kicking a ball. Of all the footballing idols, Maradona most embodies the operatic charge of the sport -- the agony, glory and romance -- and as such "Maradona '86" is a hymn to the great theater of football and its most beguiling player. Sam Blair is a documentary filmmaker and graduate of the UK's National Film and Television School. His debut feature "Personal Best," a portrayal of young British sprinters, was backed by the British Film Institute, received a nationwide cinema release and was longlisted for the British Film Awards.